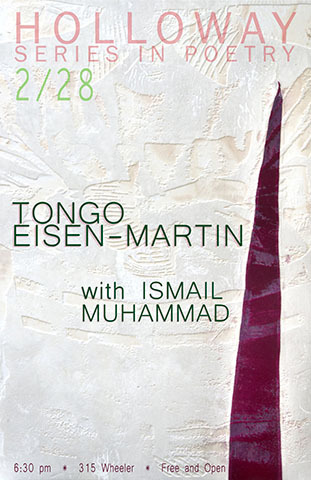 The Holloway Series in Poetry invites you to a reading with Tongo Eisen-Martin and Ismail Muhammad. The reading will take place this Wednesday, February 28th at 6:30 pm in the Maude Fife room (315 Wheeler Hall). All readings are free and open to the public. We hope to see you there! Tongo Eisen-Martin is the author of someones dead already (Bootstrap Press, 2015) and Heaven Is All Goodbyes (City Lights Books, 2017). He is a movement worker and educator whose work in Rikers Island was featured in the New York Times. He has been a faculty member at the Institute for Research in African-American Studies at Columbia University, and his curriculum on extrajudicial killing of Black people, "We Charge Genocide Again!" has been used as an educational and organizing tool throughout the country. Ismail Muhammad is a writer and critic living in Oakland, where he's a PhD student in the English Department at Cal. His writing has appeared in the Paris Review, Slate, the L.A. Review of Books, Black Aesthetic, and other publications. My dear, if it is not a city, it is a prison. If it has a prison, it is a prison. Not a city. all walks take place outside of the body.